Those who don’t know history are destined to repeat it. . . . I was sent a finished copy from the wonderful people over at Sky Pony Press. The moment I saw a Hamilton/National Treasure crossover, I knew I was going to fall in love with the idea of this book. And I did. But unfortunately the way the idea was presented truly missed the mark. 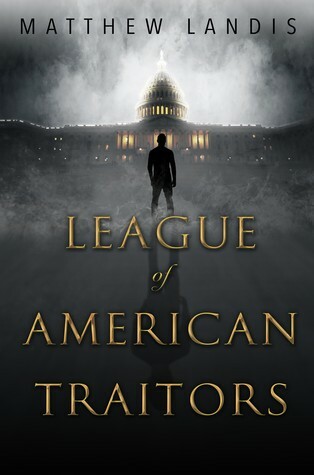 The idea of the ancestors of American traitors being targeted by the ancestors of American heroes was an absolutely stellar idea and I was so excited to give this book a go but after reading a few chapters I was truly disappointed in the writing. Though a dark plot, the writing style felt as though it was written for tweens or a middle grade reading level. As this book is being marketed for YA readers, I definitely don’t think it’s something that would appeal to many teens. I found spelling errors and sentences that didn’t flow well, which I have to blame the editor for missing these, but the overall writing style was what truly disappointed me. I wanted to love this book, I truly did. The idea was genius and it is such a shame that the writing didn’t live up to the idea. The characters weren’t well-rounded, the scenes were choppy and didn’t flow into each other and unfortunately, it was something I had to force myself to finish. The only thing that I truly liked about this story was the dialogue (which could have been fleshed out much more than it was). However, it felt authentic and real, as though this was a conversation that could be had by two teenagers. I’m not sure why this book was only ~230 pages (not counting the Author’s Note or reference pages), but I feel if it was as fleshed out as it should have been – adding description and creating the emotional attachments readers love to feel with the characters, it would have easily been a 300 page read and would have flowed exponentially better than what it does right now. I’m so saddened that this is the final copy that will be sold in stores, and wish that it had the opportunity for another round (or two) of edits. Though the idea is a powerful and unique one, this writing was the downfall of this title. This was a great idea, but not a very good story.